and all the detail of the real thing, but without all the maintenance. Welcome to the Shaker Prairie Shop online store! Thank you for taking the time to browse through our offerings that we make to enhance your home and office or to purchase as gifts and collectibles. 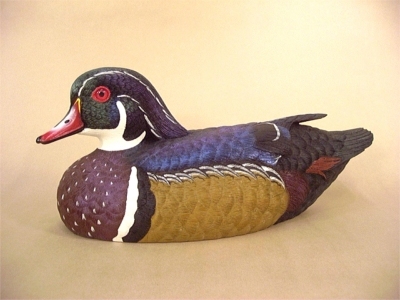 We started producing the Jules A. Bouillet line of decorative duck decoys and wildlife figures in 1977 and for over 30 years we have taken great pride in the quality and craftsmanship of every piece we have delivered to our collectors and admirers. The Shaker Prairie Shop is a family owned and operated business and along with its’ employees, hand-craft, hand-paint and carefully finish each individual piece that are sure to become lasting treasures for generations to enjoy. From the familiar waterfowl species of Mallards, Wood Ducks, Pintails and Canvasbacks, to the not-so familiar species such as the King Eider, Red-breasted Merganser, Harlequin Duck and Horned Grebe, we offer the most extensive collection of waterfowl duck decoys available. From the months of work that Jules A. Bouillet spends to carve the original duck decoy of choice basswood with his knives and grinders that literally give his subjects a personality of their own to the individual craftsmanship of hand-casting the reproductions to the air-brush and hand-painted techniques and finally the finishing touches of the felt bottoms and the signature certificate of authenticity, each Bouillet decoy is an individual creation of its’ own that anyone would be proud to own and display. We hope you enjoy your visit to our online store and as always we encourage you to enjoy God’s true creations. As a testament to our craftsmanship, our products are guaranteed to meet your level of expectation.